This year marks my 10th Christmas season in Glasgow, and it may be my imagination, but I do believe those lights in George Square are getting worse each year. Once the lights go on, I amazed people make it through the centre of town without getting migraines or seizures. What’s wrong with a tasteful arrangement of white lights, like those over Royal Exchange Square and Ashton Lane? Why can’t the Glasgow City Marketing Bureau intervene on our behalf? Surely the red lights beaming out of City Chambers and the kitsch-o-rama multicoloured bells, holly, teddy bears and candy canes undermine the Scotland with style strapline? However, the gradual appearance of said decorations is telling us to start making our Christmas lists, and who doesn’t like buying and receiving gifts? Well, many people don’t like buying them, but that’s because the cold gives us brain freeze, and we suddenly can’t think. That happens to me whenever I start hitting the stores in late November. So, I’m going to do you a favour and tell you what to buy. Well, this is really just a list of stuff that I like, so I’m telling you what to buy for all the stylish women in their early 30s who have the exact same taste as me. Maybe I’ll devote future blog entries to buying stuff for people who aren’t exactly like me. Ever since a colleague told me that spiders drink our tears when we sleep, I’ve been obsessed with finding the perfect eye mask. It may not be true, it’s probably not true, but there’s something about eye masks, very old-school glamour. This one from Graham and Green comes in many colours and is one of the most reasonably priced ones I’ve found. You can also buy a matching water bottle cover. If you don’t mind spending more than twice as much, Holistic Silk do a beautiful silk version filled with lavender. 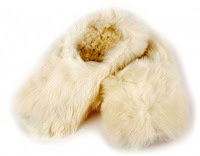 Shop with a clear conscience and buy these warm and fluffy slippers from www.biomelifestyle.com. They even give you the option to offset the carbon footprint of your purchase. 50ml size perfume with a free scented candle, available at Boots (and they’re giving out an extra 1000 Boots card points if you spend £50 or more, so add a few other items to your basket). No perfume I’ve ever worn has gotten so many compliments, not even Coco Mademoiselle. Marks & Spencer do the best knitwear in Glasgow, and you can’t beat the price. And every woman loves getting cashmere for Christmas. Stylish, attractive laptop bags that don’t cost a fortune can be hard to come by. Knomo makes several styles of bags and laptop sleeves in a variety of lovely colours. 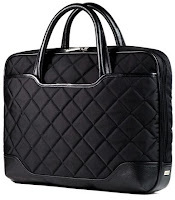 My favourite is the Toyah, a quilted nylon bag with leather trim. Available from www.knomobags.com or at House of Fraser. Get a piece of that signature Miu Miu patchwork leather without having to spend over £700. 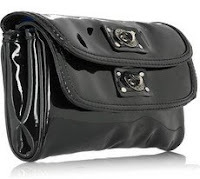 Black, patent leather, turn lock clasps, Marc Jacobs: what’s not to love? Available from www.net-a-porter.com. Check out Vi Vi Vee at www.yoox.co.uk for a much less expensive patent leather clutch.